In February 2017 I volunteered for three weeks at a small charitable organisation in Freetown, Sierra Leone, West Africa – WAYout (Worldwide Arts for Youth www.wayoutarts.org). WAYout supports homeless, conflict-affected and educationally disadvantaged street youth through training in film making, music production, creative writing and digital arts. Their aim is to empower these young people to tell their own stories and thereby gain the respect of their families, communities – and of themselves. I spent most of my time helping students with their various writing projects; including film scripts, documentary proposals, short stories, poetry, biographies, CVs, etc. But I couldn’t go to Sierra Leone and not explore some of the country’s rich basketry traditions. Although there’s a wealth of different weaving styles and types of baskets, like many places in the world these are increasingly under threat from cheaper foreign imports. 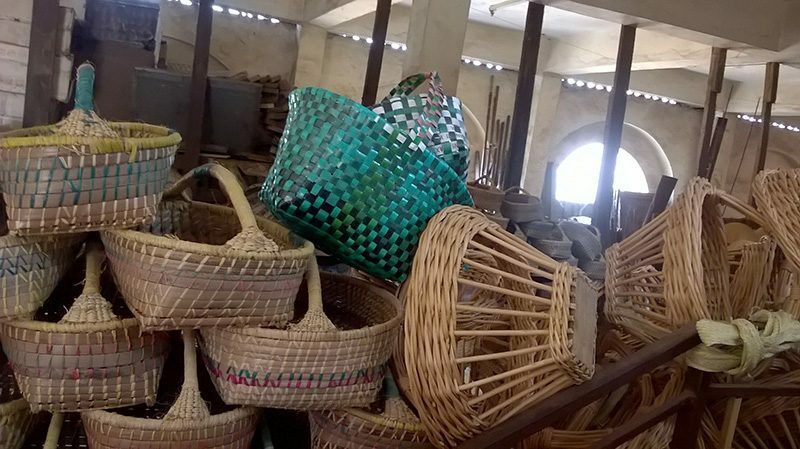 Locally woven utilitarian baskets are being replaced by plastic and metal containers for carrying and storing goods. Trade in decorative items, aimed primarily at foreign buyers, has been badly hit by the recent Ebola crisis. 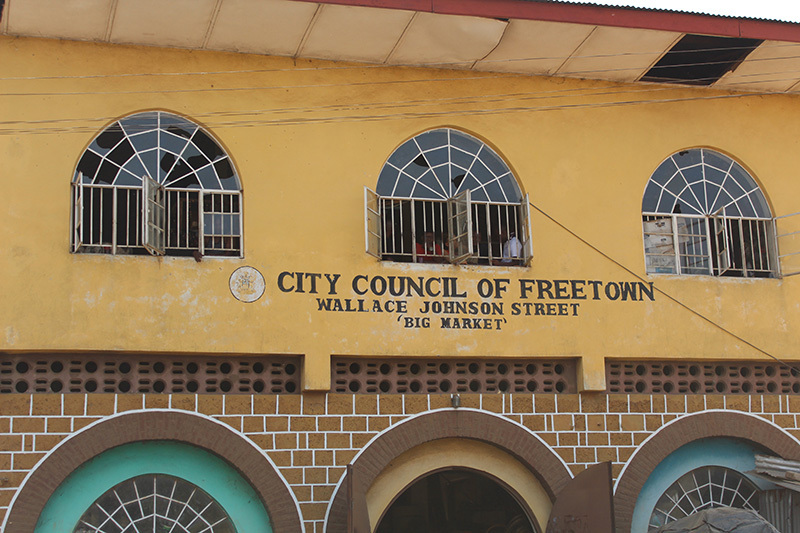 Sierra Leone’s economy and infrastructure, devastated by the ten year civil war, is still a long way from recovery. There is simply not the skills capacity or road and transport links to supply to a world market. Nevertheless basket makers are using their traditional skills to try a make a living. I decided I wanted to commission a film to showcase the film making prowess of WAYout and raise donations for them to carry on their work. I also wanted to highlight the story of one enterprising local maker as he faces the challenge of supporting himself and his family from basket making. 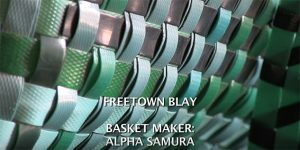 FREETOWN BLAY (‘blay’ is the Krio word for basket) gives a snapshot of the working life of 23 year old Alpha Samura, a third-generation basket maker from the provinces newly arrived in Freetown. Unable to find natural materials in the city, Alpha uses plastic tape gleaned from the streets to make his distinctive check weave baskets. His work caught my eye in the local market where he finds whatever space and time he can in between odd jobs to do his weaving. The 10 minute film was shot and edited by WAYout graduate Josta Hopps, himself an ex-street youth. 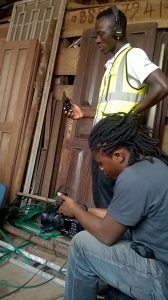 Josta is now a free-lance film maker who gives back to WAYout by training others. The musical score was written by a current student, Cleffy, who is still homeless. I’m suggesting a minimum of £5.00 or 7 Euros or $8 though you can give more if you are able. £5 equates to 40.000 Leones which will buy for example; a month’s supply of clean water, or two weeks electricity for the music studios, or 40 bowls of rice, or 20 note books, or repairs to the much used, second hand equipment, or a month’s rent on a basic shack for a homeless student.